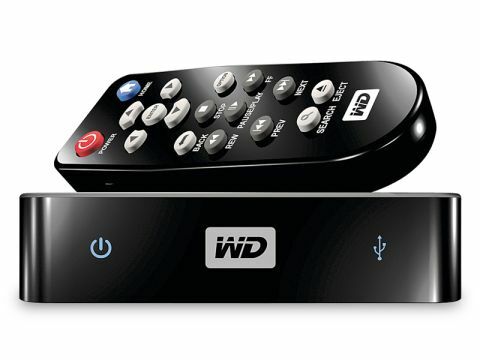 As the baby in the WD TV lineup, the Mini is perhaps best connected to your SD bedroom TV, rather than to your HD living room set. Measuring just 21x91x91mm, it features all the basics with none of the frills. Crucially, it doesn't have an HDMI output, and will output only DVD quality (576i) via the AV output, although it will upscale to 1080i via component. The WD TV Mini will fit in any system and make it easy to play media from USB devices such as memory sticks and pocket drives on your TV. It supports a wide range of file formats including AVI (Xvid, AVC, MPEG4), MPG, VOB/ISO, MP4/MOV (MPEG4), JPEG, GIF, TIFF, BMP, PNG, MP3, WAV, PCM, LPCM, WMA, AAC, FLAC, MKA, OGG, APE, SRT, SSA, SUB, and SMI files; it also supports RM/RMVB (RealPlayer) files, which the other models don't. Also supports FAT and NTFS formatting, and firmware upgrading. There are lots of useful navigation options including thumbnail, list and video previews, filename search using a virtual keyboard, slideshows, image zoom and pan, and music transport. Sadly, there is no HDMI output, so most suitable for use with SD TVs; also lacks some networking features. Also, it does not support playback of protected premium content such as movies or music from iTunes. Another point worth mentioning is there is no printed manual only a printed start-up guide and a manual on disc.